‘ShakeSpeak’ is a lot like SwiftKey proper, just with a parchment paper theme and modified autocorrect algorithm. It still learns from you as you type, except now it will suggest old-timey expressions fitting the context of your current sentence. To be clear, you still need to do some typing yourself, but it’s fairly easy to write a complete sentence pulled directly from one of Shakespeare’s plays by simply tapping on the suggestions above the keyboard. For example, starting a sentence with the word ‘to’ naturally leads to a sequence of suggestions forming “to be or not to be,” because Shakespeare. 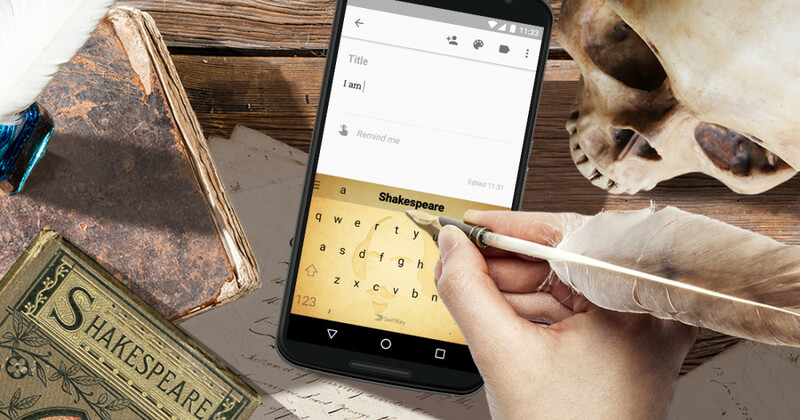 If you want more advice on how to type like a proper 17th century playwright, check out SwiftKey’s blog post at the source link below. Otherwise, you can download the app from the Play Store now.